Mayans had an advanced writing system which comprised of hieroglyphs and logograms. 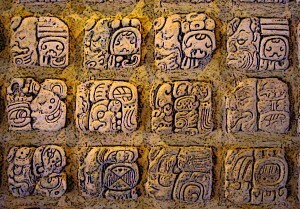 The oldest attestation of the existence of this language in the Mayan lands in Mesoamerica comes from a 3rd century B.C. inscription. The language was used all over the Mayan cities and the Mayan used it to write their texts called codices, mostly penned by Mayan priests. The individual symbols, called glyphs, which were used in the Mayan writing system were used to denote both words as well as syllables. Historically, it is estimated that the Mayan language came into definite shape by the 3rd century B.C. From then onwards, the language spread far and wide in such Mesoamerican regions as were occupied by the Mayans or influenced by them. Extensive evidence of the use of this language in Mayan cities has been found over the last few centuries. The language continued to exist very actively all the way until the 16th century until the Spanish conquest of Mesoamerica. It diminished in use and significance following the Spainish conquest but today it is still taught in Mexico. Mayans had an advanced writing system which comprised of hieroglyphs and logograms. The Mayans penned down their codices, or books, by making using of tree bark. Stone tools were first used to extract the bark of the tree which was then bleached with lime. After this treatment, the bark was sliced into strips which were then used for inscription. For writing, the Mayans used a wide variety of paints which were applied by the use of pliable hair pointed at the edge of a brush. Palettes, mortars and pestles were also used as tools in writing and illustrations of the writings. At the time of the Spanish conquest of the Mayan cities in the 16th century, a large body of Mayan writing literature existed. However, most of these books, called codices, were destroyed by the Spainish conquerors. Luckily, nearly three complete codices written during the Mayan Postclassic period have survived and exist today. These are named Madrid Codex, Dresden Codex and the Paris Codex. Remains of other Mayan literature has also been recovered in recent archaeological excavations. Most of the Mayan literature is religious in nature and deals with priestly functions related to astronomy and other studies. Mayan writing system made use of both logograms and symbols of phonetic syllables. Many words were expressed in some places using a single logogram and at other place with the help of the phonetic syllables. The individual units of the language were called glyphs and at the most, 500 glyphs were being used in the Mayan writing system of which nearly 200 were phonetic glyphs. The Mayan glyphic writing comprised of glyph blocks. Glyph blocks were a conjunction of a number of glyphs which, together, were used to mean a certain word or an entire phrase. Mostly, the glyphs were written in columns so that two parallel columns comprised of a single glyph block when read. However, other ways of laying out the glyph blocks has also been found in different Mayan writing materials recovered over the centuries. The glyphs were used with a variety of innovations so that the same glyph would fit into multiple blocks to mean multiple words or phrases. Colonial orthography made a number of changes to the regular Mayan script. These changes primarily included the transcription of ejective consonants which lead to various changes. Examples include the replacement of “k” by “c”, of “x” by “h” and of “ts” by “tz”. Most of the colonial orthography was carried out by Franciscans who came to the Mayan lands in the wake of the Spanish conquest. They made use of various orthographic tools, often varying from one Mayan region to other, to influence various changes in the transcription of the Mayan languages. Modern orthography has significantly altered the colonial orthographic practices implemented in the transcription of the Mayan languages. Today, Mayan writing makes use of the Latin alphabet for the most part and various parts of the Mayan writing system have been designated standardised alphabets to denote their respective equivalents in transcription. However, there are some disagreements in the implementation of these orthographic standard between various Mayan regions. The first major effort in modern orthography of the Mayan language was a project which published Diccionario Maya Cordemex and provided alphabets for the language which came to be widely accepted. The Mayan writing script was called hieroglyphs since it made use of symbols which were denoted by the early researchers following the Spanish conquest as glyphs. The script made use of logograms and syllabic glyphs. Logograms represented an entire concept, such as a complete object, rather than representing sounds. Sounds were represented by the syllabic glyphs which were often conjoined to completely convey an object. The script was commonly written in two closely allied columns and the writing was such that the columns were to be read top to bottom and left to right. According to researches over the past few decades, it has been confirmed that the Mayan writing system derived from a complete syllabary. This means that any Mayan writer would have been able to write down an entire text phonetically by making use of the various relevant syllables in his sentences. This goes on to show the complexity and advanced nature of the Mayan system. The Mayan writing system, called hieroglyphs, made of symbols which were meant to convey both complete words as well as phonetic syllables. Individual units in the hieroglyphs were called glyphs and usually an entire glyph block was used to convey a single word or a phrase. In all, nearly 800 Mayan glyphs have been identified although at any given time during the Mayan civilisation, no more than 500 were being used in writing. A number of Mayan books, called codices, are extant today and many pieces of Mayan writing have been recovered in archaeological excavations, so that the researchers are today able to understand a major portion of the Mayan writing system.